After resizing the HDTV desktop, the new custom resolution created is now added to the list of available resolutions for that display, and also added to the resolution list within the game or application. 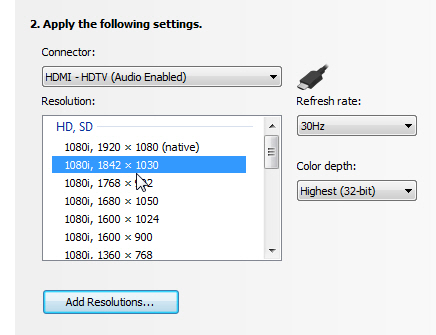 In Release 190 and later drivers, the method for resizing the HDTV desktop has changed to provide better image quality when applying underscan. This method results in a new custom resolution being created which needs to be selected from games or applications to apply the resizing. Some games or applications may not support the new resolution, however. See the screenshot below for an example. Note that the underscan has created a new resolution (1842x1030). Although this resolution looks different, it is still in HD format. Remember to select this resolution in your game or other application in order to take advantage of it.